Even as the media environment has changed dramatically in recent years, one thing at least remains true: photographs are everywhere. From professional news photos to smartphone selfies, images have become part of the fabric of modern life. And that may be the problem. Even as photography bears witness, it provokes anxieties about fraudulent representation; even as it evokes compassion, it prompts anxieties about excessive exposure. Parents and pundits alike worry about the unprecedented media saturation that transforms society into an image world. And yet a great news photo can still stop us in our tracks, and the ever-expanding photographic archive documents an era of continuous change. By confronting these conflicted reactions to photography, Robert Hariman and John Louis Lucaites make the case for a fundamental shift in understanding photography and public culture. In place of suspicions about the medium’s capacity for distraction, deception, and manipulation, they suggest how it can provide resources for democratic communication and thoughtful reflection about contemporary social problems. The key to living well in the image world is to unlock photography from viewing habits that inhibit robust civic spectatorship. Through insightful interpretations of dozens of news images, The Public Image reveals how the artistry of the still image can inform, challenge, and guide reflection regarding endemic violence, environmental degradation, income inequity, and other chronic problems that will define the twenty-first century. By shifting from conventional suspicions to a renewed encounter with the image, we are challenged to see more deeply on behalf of a richer life for all, and to acknowledge our obligations as spectators who are, crucially, also citizens. Robert Hariman and John Louis Lucaites are the masterminds behind the No Caption Needed blog. Their new book, The Public Image: Photography and Civic Spectatorship, is a vastly expanded continuation of the blog, a book that, I believe, deserves to be read very widely in the world of photography. While focusing mostly on the world of news photographs and how those affect (or don’t affect) public discourse, vast parts of the book apply to the general world of photography. In particular chapters 2 and 3, For Interpretation and Realism and Imagination, offer a passionate and at times blistering criticism of some of photography’s most cherished — and, as these authors make very clear, overrated — theories, in particular Susan Sontag’s. How or why her On Photography came to be seen as so revelatory has always escaped me. Hariman and Lucaites make a very strong case for ditching what often is little more than ill-informed fortune-cookie “wisdom,” however well it is being delivered (that’s my way of describing On Photography, not theirs). The authors then apply their reasoning to a large number of news photographs. While those kinds of photographs often are problematic, doing so still offers many lessons. To begin with, aside form advertizing photography, images in the news are the most widely seen types of photographs, and here I mean collectively most widely seen. What lessons are to be learned from what we’re seeing is not clear. As 2016 has shown, despite a history of photography that is now approaching its 200th year, as viewers we are still woefully unprepared to make sense of images and to then apply the lessons to our lives, cultures, societies. Hariman and Lucaites provide us with many invaluable ways of thinking about photography that go beyond the often narrowly ritualistic ways we use when encountering images. We ought to take note. Or we might as well continue on the path that has served us so poorly so far, continuing our march into what right now looks like a very bleak future. A gaunt woman stares into the bleakness of the Great Depression. An exuberant sailor plants a kiss on a nurse in the heart of Times Square. A naked Vietnamese girl runs in terror from a napalm attack. An unarmed man stops a tank in Tiananmen Square. These and a handful of other photographs have become icons of public culture: widely recognized, historically significant, emotionally resonant images that are used repeatedly to negotiate civic identity. But why are these images so powerful? How do they remain meaningful across generations? What do they expose—and what goes unsaid? 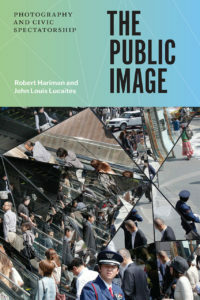 In No Caption Needed, Robert Hariman and John Louis Lucaites provide the definitive study of the iconic photograph as a dynamic form of public art. Their critical analyses of nine individual icons explore the photographs themselves and their subsequent circulation through an astonishing array of media, including stamps, posters, billboards, editorial cartoons, TV shows, Web pages, tattoos, and more. As these iconic images are reproduced and refashioned by governments, commercial advertisers, journalists, grassroots advocates, bloggers, and artists, their alterations throw key features of political experience into sharp relief. Iconic images are revealed as models of visual eloquence, signposts for collective memory, means of persuasion across the political spectrum, and a crucial resource for critical reflection. Arguing against the conventional belief that visual images short-circuit rational deliberation and radical critique, Hariman and Lucaites make a bold case for the value of visual imagery in a liberal-democratic society. No Caption Needed is a compelling demonstration of photojournalism’s vital contribution to public life. “I was truly astounded by the intelligence of the analyses in No Caption Needed, and the authors’ refusal to either over- or underestimate the power of these iconic images. Beyond that, Hariman and Lucaites engage in a profound reflection on the role of iconic journalistic photographs in modern democratic societies, the way they become ideological totems, or provocatives to further controversy. This book will be the starting point for any future attempt to deal with the problem of the iconic photograph and its social uses.” W. J. T. Mitchell, author of What Do Pictures Want? The 2007 Bruce E. Gronbeck Political Communication Research Award, which is administered by the Carl Couch Center for Social and Internet Research at the University of Iowa. Professor Gronbeck’s career reflects key changes in rhetorical studies during the past four decades, as well as his irrepressible combination of analytical rigor and good humor. The 2008 recipient of the Susanne K. Langer Award for Outstanding Scholarship in the Ecology of Symbolic Form, presented by the Media Ecology Association. Susanne Langer was an important resource in our undergraduate educations and graduate school, and the MEA award has placed us in very good company indeed. The 2007 Frank Luther Mott–Kappa Tau Alpha Journalism & Mass Communication Research Award for “the best research-based book about journalism or mass communication published each year.” Frank Mott’s achievements include the Pulitzer Prize, and Kappa Tau Alpha is the journalism and mass communication national honors society. We are very pleased to have our work recognized by scholars and professionals in journalism and mass communication, and to be joining the remarkable list of previous award winners. The 2008 Diamond Anniversary Award and the 2008 Winans-Wichelns Award from the National Communication Association. We are, of course, honored and very pleased to receive the two book awards offered by our primary professional organization. Is the aestheticization-of-suffering critique still valid? There was a time, at the end of the 1980s, when the critique of documentary photography based on the “aestheticization of suffering” was so influential that it became virtually impossible to defend documentary practice. Any such defense was regarded as at best naive and at worst ideologically suspect. Then came 9/11. I have argued elsewhere that the attack on the Twin Towers, the most photographed event in history, effectively reset the clock on documentary images, clearing away years of accumulated censure. The affective unreality of the event cried out for representation, and most people experienced it as an image. Photography’s special capacity as a medium for mourning brought us close to it again and made us realize how much we need public, shared images to make sense of such events. Susan Sontag’s book Regarding the Pain of Others (2003) was in part a recognition of this epochal shift, and it revised and updated her earlier views on photographic images and their social effects in On Photography (1977). Looking back on it now, those earlier critiques of photographic representation appear dated and overdetermined. Too many of the persistent questions about our complex relation to public images were answered as if for good. The trenchant critiques of documentary photography by Martha Rosler, Abigail Solomon-Godeau, Allan Sekula, and others were necessary corrections to a great deal of muddled mystification about photographic representation and the real effects of public images. But over time, these critiques became enshrined as definitive, and writers and artists began to treat them as unassailable truths rather than as timely interventions. Students made operational assumptions ostensibly based on, but not always supported by, these texts, and the aestheticization-of-suffering critique entered a period of academic mannerism. . . . .
No Caption Needed: Iconic Photographs, Public Culture, and Liberal Democracy approaches the question of the social effects of public images very differently. The authors, Robert Hariman and John Louis Lucaites, who come from the field of rhetoric (which they call “both a practical art and a theory of public address”), are remarkably free of the basic assumptions of the aestheticization-of-suffering discourse. They announce early on that they “take aesthetics seriously,” that they consider photojournalism to be “a patently artistic form of public address,” and that “the zenith of photojournalistic achievement is the iconic photograph.” Challenging “the presumption that visual media categorically degrade public rationality,” they approach photojournalism as “an important technology of liberal-democratic citizenship.” . . . This summer I have been having to constantly update the section of content pages in my Pop Culture class dealing with the “Media Lolitas,” and I was thinking of just forgetting about trying to keep up with the escapades of Britney, Lindsay, and Paris and just have “before” and “after” photographs. My thinking was that the iconic images for each of these tabloid princesses were now having a shaved head, being passed out in a car, and crying on the way to jail, respectively. But then I picked up “No Caption Needed: Iconic Photographs, Public Culture, and Liberal Democracy” by Robert Hariman and John Louis Lucaites and was graphically reminded of what real iconic photographs look like and how such images have a profound impact on not only our popular culture but our popular democracy. . . .
No Caption Needed speaks with eloquence to a topic of tremendous significance for contemporary society and the state of democratic public culture. It is a deeply interesting study relevant to academic and general audiences alike. Part history lesson and part analysis of where we are and where we might head, this book examines what democracy means in a culture oriented to the visual. It’s one of those gems that makes the reader rethink the world by pointing out something important right under one’s nose. Think about the photographs in our lives, the ones we keep on our desks, load on Facebook, take with cellphones and digital cameras, and attach to e-mail messages. Although the word may now be out of fashion, for nearly 100 years these images were known as snapshots. That term, however, covers some very different kinds of photographs — and some very different meanings they have for us. Indeed, in recent years, scholars and curators have been drawn to unpacking those meanings in a thriving study and display of images. It should not surprise us that this subject has become a growing focus of interest. There has been a revolution in the past decade in digital imaging and visual technology. We live in a world of pixels — picture elements — not only on our monitors but also in our everyday lives. Ours is as much a visual culture as a written or oral one, and of late, images, more than print and speech, have had the greatest impact: Visualize Katrina, Abu Ghraib, 9/11. All such images are, in effect, snapshots. . . . Very different, less private snapshots are the pictures taken by photojournalists, which can reach millions of viewers. Robert Hariman and John Louis Lucaites, professors of communication, are interested in the transmission of social knowledge. 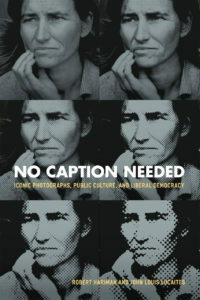 They argue in No Caption Needed: Iconic Photographs, Public Culture, and Liberal Democracy that iconic images like Dorothea Lange’s “Migrant Mother” and Joe Rosenthal’s “Flag Raising on Mt. Suribachi” are essential to a “liberal-democratic citizenship” that demonstrates “the relationship of the abstract individual to the impersonal state.” Thus “Migrant Mother” becomes a brief for social welfare, and “Flag Raising” a testament to the American character. Such images, however, are not fixed in meaning. Iconic photographs become so for a variety of reasons — their composition, the way they evoke other images in our visual memory, their impact at the moment — and they are also put to various purposes, become clichés, or are drained of original understandings. An icon of poverty like the stark, bleak portrait of Lange’s migrant mother is enlisted in a television campaign for the good life in California when a woman in a red convertible drives down Rodeo Drive and we see the image among the palm trees, a relic clearly from the past; a flag-raising mutates from civic piety to slapstick humor in an episode of The Simpsons when Bart plants the flag at a beach party. . . .
. . . Debates about the authenticity of photographs, especially war photographs, have been commonplace since at least the American Civil War. In No Caption Needed, Robert Hariman and John Louis Lucaites are less concerned with these debates than with the ways in which iconic images have been used to propose and renegotiate various kinds of ‘democratic citizenship’ and ‘civic identity’. Subscribers to LRB can read more at the link above.
. . . the fact that it is American in its scope and address does not render No caption needed irrelevant to those outside the disciplines of American Studies or U.S. politics or history. Again, the quality of its analyses is one reason for this. The other is the sheer recognisability and resonance of the images that it deals with. No caption needed deserves to be read widely for its careful readings of images, its rich scholarship, and its intelligent engagement with visual culture and public discourse. Marouf Hasian, Jr., “Iconic Materials, Hermeneutics of Faith, and the Postmodern Reproduction of Public Democracies,” pp. 1-15. Our response: “Problems and Prospects in the Study of Visual Culture,” pp. 16-20. This review is available in print form, and online for members of the National Communication Association. Cultural studies has had a rather strained relationship with photography, one overwhelmingly governed by suspicion. The idea of the photograph as essentially deceptive, routinely duping people in various politically negative ways , has been paramount. Denunciations of the apparent ‘innocence’ of the image have appeared in critical writings with a remarkable degree of repetition, as if, without them, scholars and students were always in danger of slipping back into believing in transparency (not just having their ‘transparent moments’ with a given image). For sure, any social analysis of photography has to recognize its long and continuing history of condensing and ‘naturalizing;’ meanings to strategic purpose. However, its aesthetic and cognitive force, its constitutive impact upon social imagination, needs broader terms of address. How might photography contribute to our understainnding of the world and to constructive critical alignments with it emotionally? How much do our regular enchantment by it (an enchantment whose recognttion in Barthes’ writings is part of their continuing alue) and our routine uses of it deserve more by way of scholarly attention than yet another attack on ‘transparency’ can by itself provide? The authors of this welcome new monograph try to open up a broader debate about how photographs are put to work and re-worked within public discursive space. . . .
For access to the rest of the review, go here. Hariman (Northwestern Univ.) and Lucaites (Indiana Univ.) provide an intellectually engaging, highly informative examination of six iconic photographs of the 1930s-80s, framed by three theoretical discussions of visual rhetoric. Professors of communication, the authors assume that public discourse and public arts contribute to the success of democracy. As such, iconic photographs function as public texts, first documenting a specific event and then being adopted by viewers–whether political cartoonists, artists, political demonstrators, advertisers, or ordinary citizens–for their own political or commercial uses. The multifaceted expropriation of the images results in diverse political meanings about group identity, community, and power in modern democratic societies. The authors explore images pertaining to rural poverty during the Great Depression, dissent against the Vietnam War, the democracy movement in China’s Tiananmen Square, and the space tragedies of the Hindenburg and Challenger. The book overflows with thought-provoking insights about the place of visual communication in public culture. Hariman and Lucaites’s interpretations should help students and scholars navigate different scholarly viewpoints about understanding photographs. The footnotes include additional commentary and clarification for readers interested in scholarly debates and the explosion of Internet sources. Summing Up: Highly recommended. Upper-division undergraduates and above. —M. Greenwald, University of Pittsburgh. Those who study twentieth century photography face overwhelming numbers of images. The National Archives holds eleven million. The Library of Congress has collected thirteen million more. Robert Hariman and John Louis Lucaites’s book No Caption Needed examines only nine. With all those millions of photographs waiting to be explored, one might wonder if studying a handful of very familiar shots is a promising project; but these two communication scholars have written a book that demonstrates a great deal can be learned by closely reading a few photographs we thought we knew. . . . . The rest of the review is available at The History Cooperative. Some will quarrel with the authors’ choices . . . Less easy to overlook are Hariman and Lucaites’s too frequent lapses into academese . . . Some political bias colors their work, too. . . . Still, No Caption Needed is an important book. Whatever its minor flaws, it examines some of recent history’s most influential photographs in original and insightful ways and explains how, why and with what effects these images have entered the modern mind. No Caption Needed deserves a wider readership than it may get, coming as it does from a university press whose promotional resources cannot match those of today’s commercial giants. But if America placed a higher premium on scholarly insights into the conditions of its social and political life, this book would be hailed as a classic. The rest of the review is available online for subscribers to The American Interest. The Quarterly Journal of Speech, vol 94.2 (May 2008): pp. 213-216. Perspectives on Politics, Vol. 6, no. 2, June 2008: pp. 372-373. Available in print and online for members of the American Political Science Association. Photography and Culture, vol. 1.1 (2008): pp. 129-132. The review is available as a free download here. Although not labeled a review, David Cheshier’s July 25, 2008 post on The Visual Iconic at The Amateur Humanist provides thoughtful discussion of the book. [Dutch Journal of Media History] TMG 2.1 (2008): 140-142. The review is in Dutch. The review is online here. Rhetoric and Public Affairs, 12. 1 (2009): 124-125. Argumentation and Advocacy 44.2 (2007): 110-112. Rhetoric Society Quarterly 40.1 (2010): 94-97. I’m sure I’ve missed some folks, and hope to get to them when I get a minute to update again.